Halloween is just around the corner! Are you ready to celebrate with your little ghosts and goblins? If you are a regular follower, you know that breakfast is BIG at our house. It is my husband's and kids' favorite meal of the day, which has led me to the tendency of styling breakfast themed tables in place of the popular dessert tables on occasion. I liked the idea of a Halloween BOOfast Celebration because it allows guests to celebrate Halloween and the autumn season without the focus being on candy. Don't get me wrong, I know how important candy is to young and old alike on Halloween. I'm not trying to veto the candy! This just allows for a festive celebration before the main event (Trick-or-Treating!) without the sugar overload. I wanted to make the Halloween BOOfast table simple and easy to re-create, healthy enough to satisfy my fellow moms, and appealing to even the littlest party guest. This breakfast themed table would be perfect for a Halloween party, playdate/playgroup celebration, or even to surprise your little ones on Halloween morning. The BOOfast menu included pumpkin muffins, a variety of cereals, yogurt parfaits with various topping choices, and milk. Everything was "dressed-up" so that the kids wouldn't even notice that the candy and sweets were missing. It's amazing how a little wrapper and cupcake topper can transform a muffin! The kids won't even notice that the extra sugar or icing is missing from these pumpkin muffins. I found these adorable mini tins a few years ago in the Target Dollar Spot and I have gotten so much use out of them. I decided that they would be perfect for getting the kids excited about having a bowl of cereal. Don't be fooled...these cereal choices are healthy and light on sugar content as well (Fiber One, Whole Wheat Chex, and Gorilla Munch). Just don't tell the kids! Milk in a plain glass just won't do for this celebration. Instead, I transformed empty jars into a Ghostly Glass of Milk! My kids LOVED these and they are so incredibly easy to make. I used small, paper-wrapped canning jars to serve yogurt & fruit cups while the ceramic pumpkin containers held granola, dried fruit, slivered almonds, and other topping choices for the guests to choose from. To dress up the serving table, I covered two lamp shades with black card stock and added some buntings for fun. This is an inexpensive way to temporarily transform an item that you already have at home (in this case, a lamp) to add to your table's decor and the overall presentation. I also made some paper rosettes and used a few Halloween decorations that I had at home (the cute witch and the spiders on each end) to finish things off. 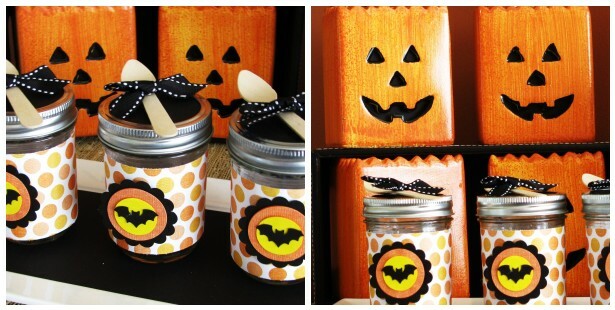 I hope that this BOOfast Table has inspired you to start your day off with a little Halloween Celebration! Not sure how I found you but I am sure glad I did. I pinned so much inspiration from your blog on Pinterest. You absolutely rock with your ideas!!!! I am subscribing NOW! I just LOVE this !!!!!! Beautifull breakfest party !!!! congratulations ! HOLY MOLY. This is so cute and so healthy. I love everything about this table AND YOUR BLOG. I'm linking to my post for tomorrow. Hope that's okay! black dressesold dickensian Christmas CARDS and movies. Such a beautiful set up! Welcome and thanks for stopping by! I am Sarah, owner and designer of Sheek Shindigs. Growing up, our family enjoyed celebrating life's special moments and events together. Now, as a mother of 3 and someone who loves to entertain, I find myself looking for reasons to CELEBRATE with my own family. Whether planning a birthday party, baby shower, or play date, I enjoy creating unique and memorable experiences for everyone involved. The Sheek Shindigs blog was created to inspire others to create their own "sheek" shindigs and celebrate life's special moments. I hope that you will stay awhile, browse around my site, and become inspired by the featured parties, products, recipes, crafts, and entertaining ideas. Happy Celebrating!